UPDATE: — The mother of a 2-year-old Largo boy, who was the center of a statewide Amber Alert, has been charged with murder in the death of her son. BREAKING UPDATE (9/4 8pm): The Florida Department of Law Enforcement has canceled the Amber Alert for 2-year-old Jordan Belliveau, who was found dead on Tuesday afternoon, according to Largo Police. "Jordan has been found, in a wooded area behind me," Police said during a press conference Tuesday. His body was found by investigators in the wooded area near McMullen Road and Alt Keene Road in Largo. 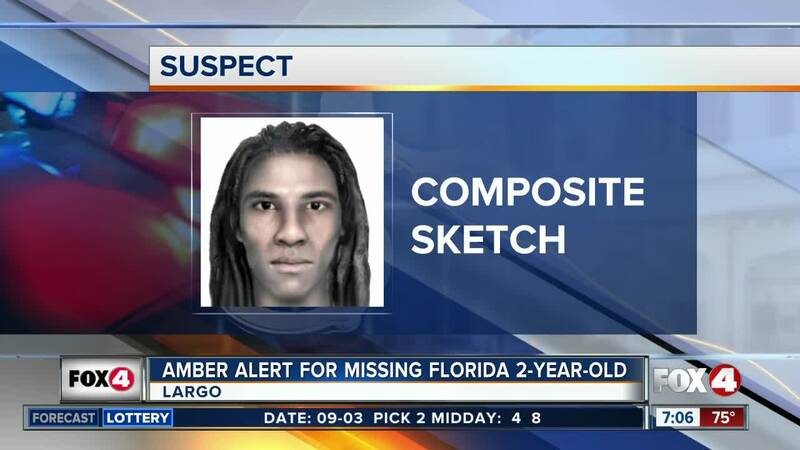 LARGO, Fla. (AP) - Police have released the sketch of a man they're looking for in the case of a missing Florida toddler. The boy's 21-year-old mother told investigators she and 2-year-old Jordan Belliveau were walking Saturday night when she accepted a ride from a stranger named "Antwan" in a white Toyota Camry. She told them he punched her in the face and knocked her unconscious. She said the boy and the man were gone when she woke up hours later in some nearby woods. Largo police Maj. Stephen Slaughter called her a "struggling single mom." He confirmed Monday that child protectives services had investigated the family for domestic violence, and officers recovered bloody items from the home. An Amber Alert has been issued. Slaughter appealed for residents to check their security videos.